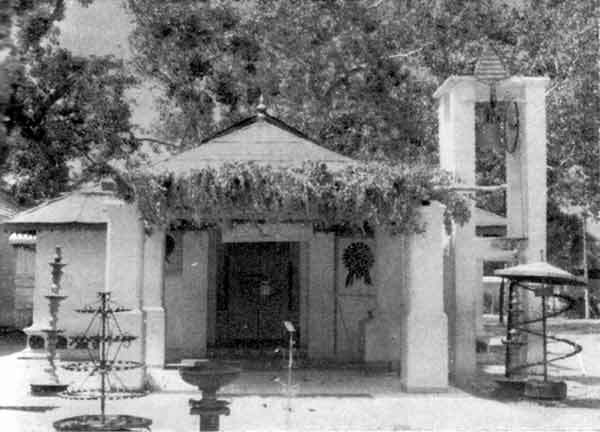 According to legendary history Ruhunu Kataragama Maha Devalaya (at right) was built by King Dutugemunu around 160 years B.C. in fulfillment of a vow to defeat King Elara in battle. It was endowed with large extent of land by King Dutugemunu for its maintenance and subsequent monarchs did likewise. The 'building is a simple structure of two apartments and with no embellishments or show of grandeur. It has not undergone any major structural alterations, during this long period of over 2,000 years since its construction. Rubeiro in his History of Ceylon says that 'four leagues inland from this spot (the salterns in Hambantota) is a Pagoda held in great reverence by the Grutiles; here are preserved the offerings which had been made for many ages, consisting of gold, jewels and precious stones, and 500 armed men are always maintained in its defence”. This was in 1642 when Rubeiro was one of the 150 Portuguese and 2,000 Lascarins who made a vain attempt to locate this Pagoda and plunder its wealth, but “were forced to turn back the way we had come without effecting anything and without even seeing the Pagoda, which is called Catergao”.